Don't reply to compensation texts | What Car? 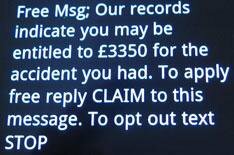 Don't reply to text messages claiming you are due thousands of pounds of compensation from a road traffic accident, says a communicatons watchdog. The unsolicited texts could convince recipients that the sender has legitimate access to their details because of the precise amount of compensation mentioned. However, when We contacted one company responsible for sending these marketing texts, the operator confirmed that compensation figure mentioned in the text is fabricated and not based on a review of any incidents the recipient may have had. 'Put simply, these texts are a marketing ploy - a fishing expedition to establish what telephone numbers respond and are thus 'live'. 'When this process results in successfully obtaining of an individual's personal details, these are sold on as a 'lead' to an injury claims company. Lists of such 'leads' are a valuable commodity in less professional marketing arenas. Even replying 'STOP' to opt out of receiving messages could mean that your number is seen as live and be sold on to marketing companies. So the advice is to ignore the message completely.